One of our favorite foods is Piiman no Nikuzume - Japanese stuffed peppers. They're surprisingly quick and easy, and I make them quite often, the only reason why I haven't done a post yet is because in Australia we didn't have real piiman, so I was making them with green capsicums (bell peppers)! Luckily they taste great made with capsicums/bell peppers so anyone around the world can make them. 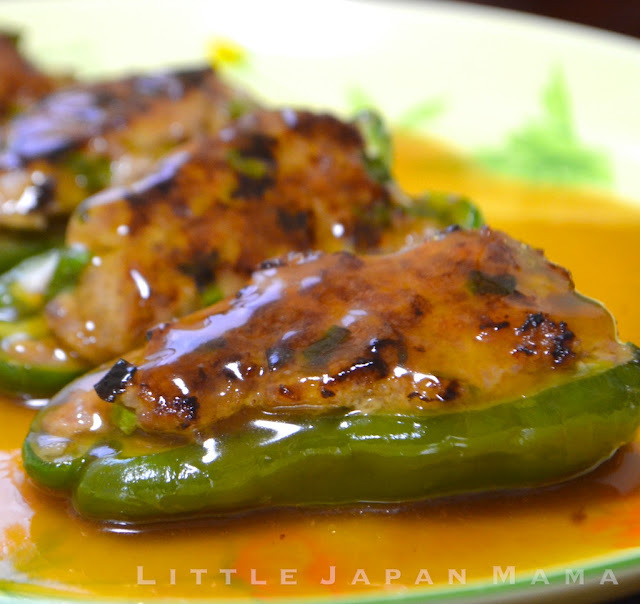 This version of Piiman no Nikuzume is our favorite, with a thick, juicy, glaze-like sauce. 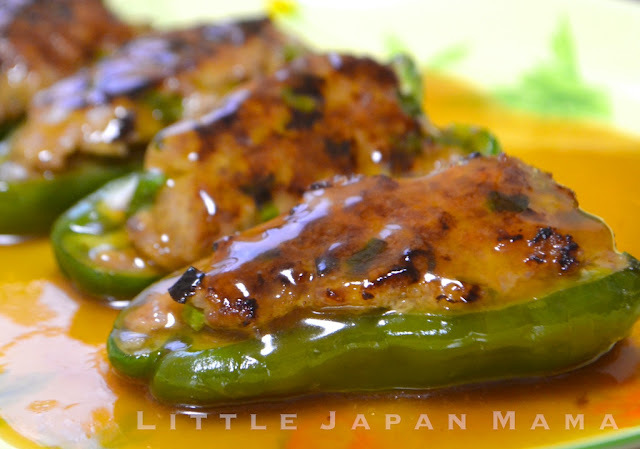 Based on this recipe by ラビー on cookpad. Place egg, panko and mince in a mixing bowl, and knead/mix until well combined. Mix in shallots. Slice peppers/capsicums in half or, if you couldn't get small ones, (as I often found in Australia) slice in thirds or quarters lengthwise along the natural lines of the capsicum, making sure they have enough depth and roundness to hold the filling in. You can sprinkle the insides with flour if you like, to help them to stick better, but I find this is not usually necessary. 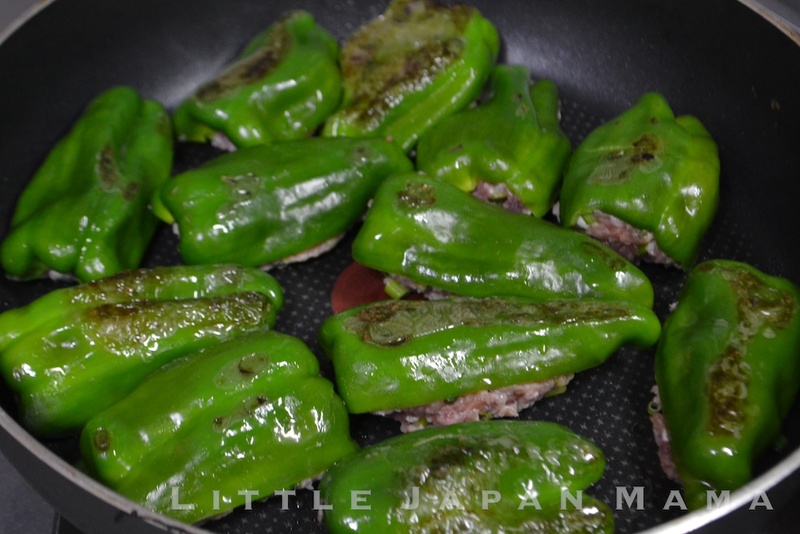 Heat a little oil in a frypan, and arrange the peppers, skin side down, until the surface just has a grill mark. Flip the peppers so the pork side is down, press gently. Cook until well browned. Flip peppers pork side up again and use a paper towel to wipe excess oil from the frypan. Add Sauce Ingredients to the frypan and simmer until pork is cooked through. Place peppers on serving plates. Add cornstarch mixture to the frypan, stir and bring to boil to thicken. Pour over peppers. Serve immediately, with rice and salad if you like. 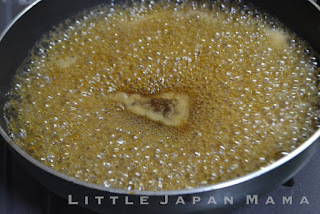 Sprinkle with Shichimi if you like a little spice. If you're keeping them for later, do not pour the sauce on yet. Keep them separate until after re-heating, then pour the sauce on just before serving. 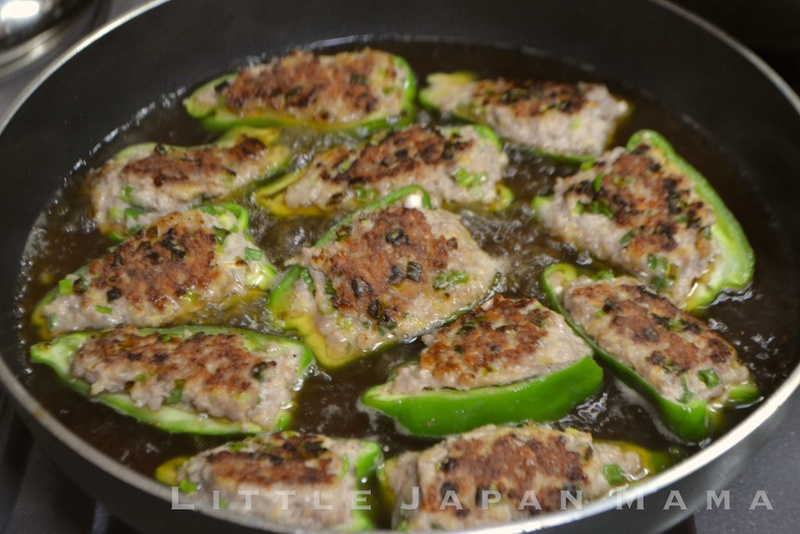 I try to cook the pork as well as possible in step 4, and keep step 5 simmering as short as possible, as I like the peppers to still have a little crispness. Hi Shinobu, my parcel arrived today. I'm so excited. Please can I post a link to your site on my blog? I want to share the joy! Thanks for a great blog. I just recently found your blog searching for an gyudon recipe and I'm so glad I did! I live in Japan and I love cooking Japanese food, but since my reading is terrible I don't always understand everything a recipe is saying. These look great and much better than what my grocery store sells. Hi! I love your site and have been busily trying some recipes including this one! I used potato starch instead of corn starch and my sauce went into a jelly like substance that tasted great but was really difficult to eat! Is there any way to know when to use corn starch vs. potato starch? Also do you know if you use an equal amount (ie. if recipe says 1 tsp of corn starch would you use 1 tsp of potato starch?)! Thanks Kirsty! Yes, katakuriko is stronger than cornstarch, so use a little less. Sorry if my measurements are a little off sometimes, I sometimes don't measure >< my mum never does! Glad you're enjoying my cooking blog! Thanks for your quick reply! I wish I had enough cooking talent to not measure but I need a lot more practice before I can do that, otherwise it tastes terrible. We've also made your Hiroshima-yaki which was DELICIOUS! Thanks for putting your recipes up, I can't wait until you have some free time to put more up! 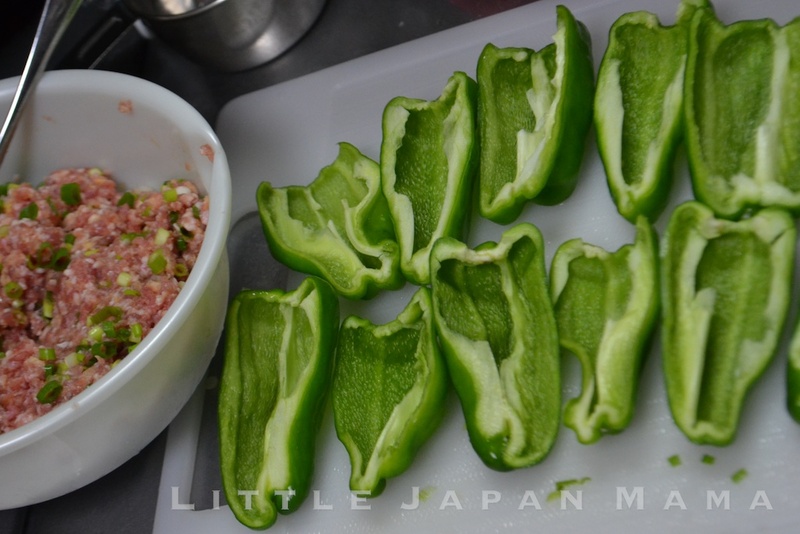 I bought these little peppers at Nijiya Market and a very nice gentleman explained how to make Piiman no Nikuzume, which of course I did not remember entirely, so googled it and found your recipe. The gentleman told me I could do it in a wok, and to use worchestershire sauce and ketchup to the broth for sauce. I am going to take a hint from your recipe and add chicken broth, also. Next time when I have Mirin I will try that. I bought also a Piiman pepper plant so I hope to have lots of these peppers soon in my garden. Thanks for your recipe and the beautiful photographs. I found these peppers in San Jose, CA at Marukai Market on Stevens Creek Blvd under the name of Peman Peppers. Love this market. I drive from Santa Cruz to shop there. Wonderful selection of Japanese meats and fish not to mention their Sushi. 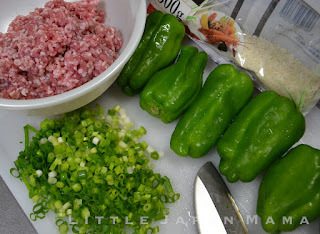 I used red and green piimans and my husband and I actually preferred the taste of red ones in this recipe, but as red piimans are more expensive I imagine I will be making it more often with green ones. I used olive oil for frying, I was worried it might ruin the sauce, but it wasn't an issue. 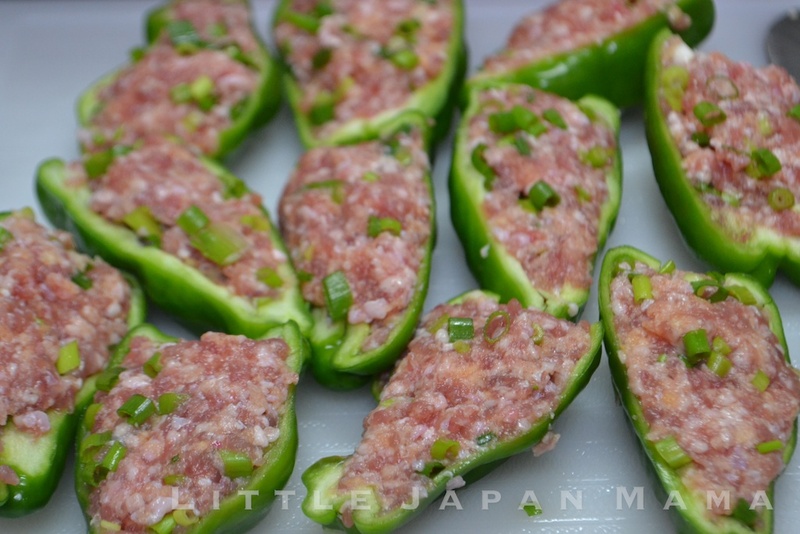 200 gr of meat was enough for 4 normal sized Japanese piimans, that's 8 stuffed halves. The two of us could eat it, but it would be okay for 3 people.